Replacement trampoline pad, easy and quick assembly, prevents injury. 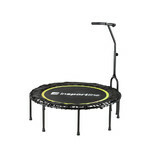 Trampoline with Handlebar inSPORTline PROFI Digital 140 cm is a modern trampoline for club training activities, newly fitted with a computer. 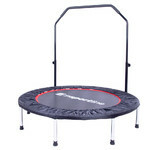 Trampoline inSPORTline PROFI Mini Digital 140 cm has a handle as a support and a training accessory. The handle can be attached and removed again. The trampoline meets the world's highest safety standards. Trampoline inSPORTline PROFI Mini Digital 140 cm was tested to meet the European standards EN-13219 and EN-913 (concerning trampoline functionality and safety and safety of childrens gymnastic equipment respectively). Its ideal jumping attributes are provided by a set of Super-High non-corrosive galvanized springs and UV resistant jumping area with a high bounce. The frame of the trampoline is made of galvanized Heavy Duty steel tubes with increased resistance. The trampoline is newly equipped with a computer that can calculate and display values such as a time, calories burned (indicative) and a number of jumps per minute.